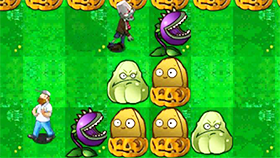 In this game, your task is to survive and destroy the zombies. Zombies will appear randomly in the map and you must destroy them all. In ZOMBIE DAY, you will play with "first person perspective". At the start of the game, you will be in a room with a lot of weapons such as pistols, machine guns, shotguns ... However, you need money to buy them. You will have money from killing zombies. Besides, killing zombies will also increase your score. Your gun will have ammo limits. However, you can collect other weapons to continue the fight. You will have an HP bar. When you are attacked by zombies, this bar will decrease. When the HP bar is reduced to 0, you lose. Note: This game has no limit, you will fight to death. When your gun runs out of ammunition, you have to spend time reloading it.